Businesses fail when they refuse to accept what they aren’t good at. The wisest business owners know their weaknesses. There is something that you are doing right now, in your business, where someone could do it better, faster or more affordable than you can. 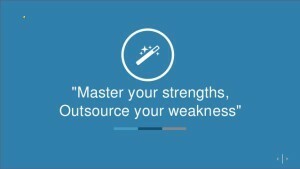 The first – and easiest step – is to outsource the practice areas where you don’t excel. This may be accounting, so you can find a Virtual Assistant bookkeeper who can provide value to you in that area. The next step can be a bit trickier – there are tasks that you are currently doing, that you might be doing an adequate job at. It’s just that someone could again do it better, faster or more affordable. For example, think about social media. You might be adept at developing content and scheduling postings, but could you outsource it to a social media Virtual Assistant who can create an actual content calendar or evaluate your analytics to determine the best times to post, for your target market? The last step is to think about areas where your company has weaknesses, and it’s wasting your time – as the leader of your company – trying to figure it out. As a key person in your company, you shouldn’t be taken away from core business duties that drive profit. It might seem like doing it in-house, or doing it yourself, saves money, but not when the analysis includes the opportunity cost of using yourself (or in-house team) in less productive tasks.
. Delegating done right can be the key to unlocking your company’s true growth potential and scalability.